In order to do proper diagnostics you will need a scan tool and some special tools available from Mopar Special Tools. If you don’t have service information you can buy a subscription online at alldatadiy.com or eAutorepair.net. The high pressure pump builds the high pressure and delivers it to the fuel rail manifold, which buffers out pressure fluctuations and distributes fuel to the individual injectors. The fuel quantity valve (fuel control actuator, M-Prop) in the high pressure pump controls pressure output from the pump. The fuel pressure solenoid (pressure control valve) in the fuel rail has final control of rail pressure and prevents over pressurizing of the system. 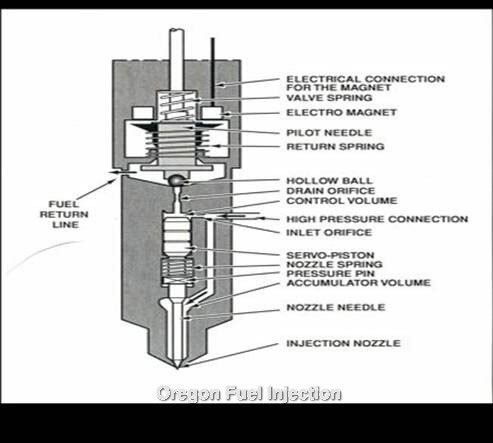 The injectors have a hollow check ball that holds rail pressure until the fuel solenoid is actuated by the ECM, this allows the check ball to rise off its’ seat and an injection to take place. If the check ball in the injector is leaking or the fuel pressure solenoid is defective then it will not build enough rail pressure to start the engine. The fuel system contains high pressure fuel up to 23,500 PSI. Do Not use your fingers to find leaks! High pressure fuel entering your bloodstream may result in amputation or loss of life. Ensure that you have a good clean fuel supply. Verify that battery voltage is above 12.0 volts. No or low fuel supply pressure to the high pressure injection pump (CP). CMP and CKP Sensors must be in sync. Exhaust leaks or Boost leaks, you can usually hear a boost leak as a high pitched squeal under load. VGT turbo sticking and/or not operating properly. EGR system fault. Usually this will set a code. A bad or incorrect torque on an injector, missing or damaged chamber gasket, low compression, excessive valve lash, flat lobes on camshafts could all cause a miss. Injector hold down bolts must be replaced if they are removed, they are a torque to yield bolt. If not they could stretch and cause compression to blow past the injector, which can overheat the injector and cause it to fail. There is a relative compression test available using the DRB3 or wiTECH scan tools. Acceptable values between two cylinders must be equal to or less than 15 rpm. There has been some issues with the harmonic balancer which may cause rough running at different RPM, leaking crank seals, some sensor issues. 01-05 model years. Restricted or aerated fuel supply to the high pressure pump. If the smoke clears in less than 1 minute, this could be normal depending on temperature and altitude. Blue white smoke that burns your eyes is UN-burnt fuel. Cold temperatures, high altitude and excessive idle time all mean incomplete combustion. Possible bad injector, leaking at the nozzle tip. The intake air temperature, coolant temperature, inlet air temperature and battery temperature should all display normal ambient temperatures when cold. If not, repair as necessary. Check glow plug system operation when cold. Check rail pressure when engine is off, it should be 0 PSI (+/- 500 PSI). Aerated or restricted fuel supply. Excessive idle time can cause white smoke when cold due to carbon build up on injector tips. More than 20% idle time is excessive. 2001-2003, use a mechanical supply pump on the front of the head to supply fuel to the CP3 pump. Cranking fuel pressure 6-22 psi, Idle 29-36 psi, and maximum pressure 51 +/- 7 psi. 2004-2006 model years use an electric supply pump in the tank to feed the CP pump at 58 to 80 psi. Minimum pressure is 58 psi, measure before and after the fuel filter to verify any possible filter restrictions. The fuel pressure relief valve (cascade overflow valve), in the CP pump, limits the fuel supply pressure to the fuel quantity control valve. The pressure relief valve should open at 72.5 psi. The fuel pressure solenoid is attached to the rear of the fuel rail. The tip of the fuel pressure solenoid uses a knife edge, for metal to metal sealing. The knife edge actually deforms the metal in the fuel rail in order to seal the surfaces. The solenoid must be replaced if it is removed from the rail. The solenoid controls and maintains the rail pressure as commanded by the ECM. In a DE-energized state, the fuel pressure solenoid is held closed by spring force, like a relief valve. During starting the fuel pressure solenoid is held closed by magnetic force to allow enough pressure for starting. When checking the fuel pressure solenoid there should be no fuel coming out the return during cranking, and it should hold 870-1450 psi when unplugged during cranking. If it doesn’t, and the injectors are OK, then the fuel pressure solenoid is bad. When driving, the fuel pressure solenoid is constantly somewhat open, the pressure of the fluid counteracts the magnetic force of the coil and the slight spring force to help maintain desired rail pressure. If the actual fuel pressure, vs the fuel pressure set point, gradually drops and then spikes well above the set point then the fuel pressure solenoid is sticking and usually needs replaced. Most starting problems due to low rail pressure are caused by bad (check ball seat) injectors or the fuel pressure solenoid in the fuel rail. You can unplug the fuel quantity control valve, in the CP3 and the pressure should default to maximum (23,500 PSI). However, if there is a leak in the injection system then the pump will not build enough pressure. If there has been a major contamination issue with dirt and or water then it is very likely that the high pressure pump will need to be replaced. The injectors are typically damaged first, but any contamination that got into the injectors also went through the CP pump. If the cascade over flow valve is bad this can send fuel out the return line instead of to the charging circuit of the CP pump. If the engine is running, there is a “Pump Pressure Generation Test” available using the DRB3. Rail pressure should increase from about 5800 psi to about 20,305 psi in about two seconds. If it does not, there is likely a high pressure fuel pump problem, provided that the injectors and fuel pressure solenoid have been tested and are good. *The injector hold down bolts are torque to yield. They must be replaced when removed, they are one time use only! If they are not replaced it will most likely lead to the the injectors coming loose while running, and possible damage to the cylinder head. It takes about 3600 PSI rail pressure in order for the injectors to deliver fuel for starting. Excessive leakage in the injector usually results in a starting issue, which could occur hot or cold, but usually occurs hot because the fuel is thinner when hot. Excess leakage from the injector is returned to the tank, it is not an external fuel leak. Per Chrysler, unplug the cam sensor and fuel rail pressure solenoid, and plumb the individual injector returns in to graduated vials. Run the cranking Fuel Quantity Test with a scan tool. In 10 seconds of cranking the return should be no more than 2.5 ml per injector. If more than 2.5 ml, replace the injector, clear the memory using the scan tool and retest. Multiple failures are possible, because hydraulic flow will take the path of least resistance. You can also perform the engine running Fuel Quantity Test. After 10 seconds a maximum of 40 ml is allowed, if more replace the bad injector, clear the memory and rerun the test. See the service manual for more information. Run the turbo actuator test with the DRB3. If the actuator rod does not move at all or does not move evenly inspect the pivot where the rod connects to the vane lever. They tend to corrode and limit movement. Clean up the pivot and rod, apply high temp grease and retry. If it still does not move correctly and the electrical power supply and ground check OK, then the turbo needs replaced. The actuator can not be replaced separately from the turbo. Note: Do no try and move the actuator rod externally by pushing or pulling on it. The actuator rod has a worm rive gear attached to it which does not allow movement from the output side. Use the following information regarding diagnostic trouble codes in addition to the normal diagnostic procedures outlined in the service manual or technical service bulletins. *This code is not listed in Chrysler service literature for Sprinter but may set or show with some scan tools. Check injector resistance, should be less than 1 ohm and greater than zero ohms (zero ohm meter leads before test). This code is not listed in the Chrysler service information for Sprinter, but it is an OBD2/Global code that can be stored in the Sprinter ECM and will show with some scan tools, often in conjunction with P2359. Plugged air filter, 2004-2006 air filters should not have a foam pad glued to them. Usually defective cam sensor, however occasionally a bad crank sensor may set this code. Most commonly set due to a cracked and/or leaking turbocharger resonator assembly. Other boost leaks at intercooler, intercooler piping, etc.